One of the questions I see asked a lot on the social web is: “Why does [whatever network] not allow unregistered users to see what I publish?” I understand the frustration. Social networks of this type are normally known as “closed platforms” or “walled gardens”, and they heavily restrict the reach of their members. It’s true. Especially with new social networks. We all like to check stuff out before we commit to it, but if a fledgeling social network let us roam around its environs as some of us inevitably would given the chance, we’d probably never join. Unlike content-specific platforms, social media’s primary content is a brand of Me-Me-Me-ing. People either indulging their egos, or trying to find ‘romance’, or trying to sell something. This type of self-focused content normally has no real value to an outside audience. So classic social media attempts to block all of that out, and focus on the concept of YOU being the centre of attention. The home page is just a sign-up prompt, because the thought of what the site might be, is a lot better than the reality of what it is. In order to tie all of your behavioural and usage info specifically to you, the platform needs you registered, with a unique login. Refusing access to anyone who isn’t registered will force all platform users to log in, and thus be uniquely recognised each time they visit. An accurate dossier can then be built, regardless of device or browser. With a forced login, even if you’re at work, or using a proxy, the network still knows it’s you, every single time. Incidentally, the fact that a social site promises: “We do not collect/sell your personal data”, does not necessarily mean they don’t data-mine, or that they don’t sell data. It just means they don’t sell data which expressly identifies individual users. They’re almost inevitably still profiling and behaviour-logging members, and exploiting the data they collect. So this reason would likely still apply with networks who claim a “privacy” focus. A closed social network is a much more reliable server of targeted adverts than an open platform. If people can visit without a login, the site can’t guarantee to recognise them, and unrecognised users have no documented history upon which to base ad targeting. Result: the site owners can’t target ads. Given that targeted ads generate nearly three times the revenue of non-targeted ads, the motivation to force all users to identify themselves via a login, at all times, will prove irresistible for some networks. There’s also the critically important fact that more effective advertising means more repeat ad placements. Displaying targeted ads is an obvious goal for many social networks, but displaying targeted content is even more important. If you’re seeing content that’s irrelevant to you, you’re more likely to log out, and if you log out, there’s a very good chance you won’t go back. If that happens, the platform can’t make any money out of you at all. So social media uses machine learning to establish what users want to see, whom they might want to follow, etc. Over time, the mechanism gets better and better at ‘feeding’ people in line with their interests. That means members are more likely to stay. But in order to achieve this, a social network once again needs to precisely recognise each user. By creating a closed platform, which users can only access with a login, the network can be pretty sure it’s serving properly targeted content to the right people. A lot of content published on social media is posted in breach of copyright. The platforms don’t care per se, but if a lot of copyright holders serve the administration with DMCA takedown notices, it costs the platform a lot in time and labour. Running a walled garden means no outside search indexing or crawling. That in turn means copyright owners who reverse-search their content on the open web will not discover it, and will therefore not serve the social network with takedown notices. Most content stolen on the Internet is not taken during a visit to the source site. Images, for example, are more likely to be downloaded directly from search engines, or scraped by bots through an API, or via RSS, or whatever. But closed platforms are inaccessible to search engines, do not have APIs or RSS feeds, and cannot be reached by scraper bots. This means that content posted on a closed platform is more likely to remain exclusive to that site. The platform’s value as a resource is thus increased, and the original contributor’s morale is less likely to be damaged. This has nothing to do with user-privacy. It’s about money. The value of users’ data is higher if it can’t be freely harvested by everyone who wants it. Fully open social platforms, like Twitter, can be indexed by outside search engines. Twitter’s own search facilities are excellent as social media search goes, but there are still elements of important data that Twitter’s own search won’t find. That’s not a problem for data-harvesters, since Twitter can be searched through third-party resources, such as Google. That’s the deal with an open platform. Marketers can collect their own data and then bypass the social network. But with a closed platform, outside search engines have no access to content or user information, and that means all dissemination remains within the platform’s own control. The closed platform can arrange things so that only confirmed friends get to see potential marketing preferences. If a business wants access to potential customers on a closed platform, it must pay to reach them. Bubbling is what happens when a machine learns your preferences, and then filters out anything it decides you shouldn’t see. Such a system can not only hide content from you – it can also hide entire profiles. The easy way to break out of a machine-learning bubble is to log out of the site, and visit as an unregistered guest. But with a closed platform that’s not possible. If you’re logged out, you have no access to the site. Why does social media want to bubble you? The shortest answer is: money. Closed social media platforms can, and in some cases certainly do, serve users a bot-curated ‘feed’ that has little to do with individual choice, and a lot to do with the choices of the sites’ real customers – the people and organisations who pay. 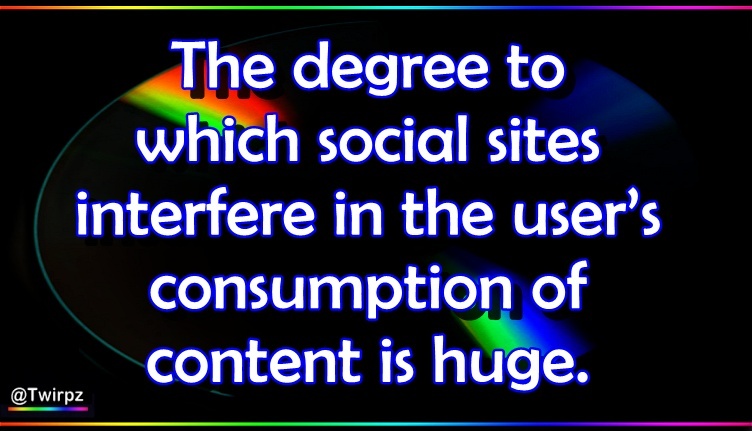 Ultimately, control of users’ feeds equates to earning potential, and as a result, the degree to which social sites interfere in the user’s consumption of content is huge. Closed platforms not only have a tighter grip on the level of interference – they can also better conceal that it’s actually happening. When members are posting on a closed platform, and they want their friends or audience to see what they’re posting, they can’t just send them a link. They have to get those third parties to actually sign up to the network. 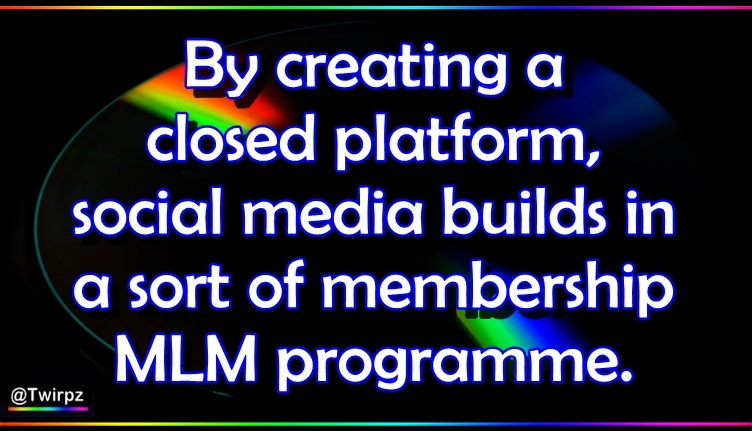 So by creating a closed platform, social media builds in a sort of membership MLM programme. Stopping trolls can be difficult on an open platform, because even when their logins are disabled, they can still monitor the site as a “guest”. On a closed platform, a block or a suspension has more meaning, because visits are not possible at all without a login. The slightly farcical scenario of a photographer blocking a content thief, only for that thief to log out, regain access and continue stealing, is less of a factor on a closed platform. Of course, persistent trolls can set up new accounts after being blocked or suspended, but they may not be as motivated to do that if they can’t visit the site without a login and see what’s being said. And if they’re a major annoyance, more than one person will be blocking or reporting them, which means that to regain full access, they’d need to be setting up new accounts all the time. That would be prohibitive. As tracking becomes evermore sophisticated, closed platforms can also decline new registrations for disruptive users – severing them from the community entirely. The fact that social platforms use algorithms to determine who sees what is no secret. But the minutiae of how those algorithms work definitely is. With an open platform, it’s much easier for us outsiders to work out what’s going on, because we can measure the difference between a neutral environment (the one we see when logged out) and a tailored environment (the one we see when logged in). The effects of a closed platform’s algorithms are much harder to determine, because there is no neutral environment. Even if we create ten different accounts, they’ll all have a bias of some kind. We don’t have a benchmark. Any member of the public could game the system and unfairly grow their profile. ‘Bad actors’ could use the knowledge to evade penalty. If the algorithm has even the remotest bias, the press/public may accuse the platform of favouritism, or even sexism, racism, political corruption, etc. Marketers might be reluctant to advertise if the targeting of ads is discovered not to be as efficient as they imagined. And that’s just for starters. It’s definitely not in a social network’s interests to reveal its algorithms. Whilst the notion of “open” and “closed” social platforms is a convenient binary, most platforms fall somewhere in between open and closed. The Holy Grail is to make the platform appear open, but make accessing specific content or data such an unrealistic prospect that the site effectively performs as a walled garden. For example, whilst individual posts may be accessible without a login, they may not be realistically searchable on the platform, and additionally, the platform might block crawler bots so the posts are not indexed by external search engines either. You can read the post if someone gives you its URL, but you’re not going to find it if they don’t. 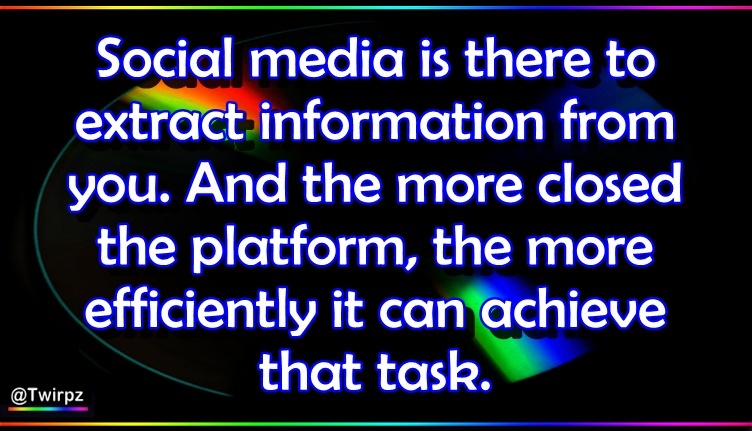 Social media is there to extract information from you. And the more closed the platform, the more efficiently it can achieve that task.